Her story has permeated the nooks and crannies of Nigeria and even made international media headlines. It has evoked compassion, opened doors in least expected places, ushered her into realms of glory and brought her fame. Most of us have been itching to know her struggles before she attained the ‘celebrity’ status. Well, the beautiful mother of two has opened up in an interview with PUNCH newspaper. Read excerpts below. 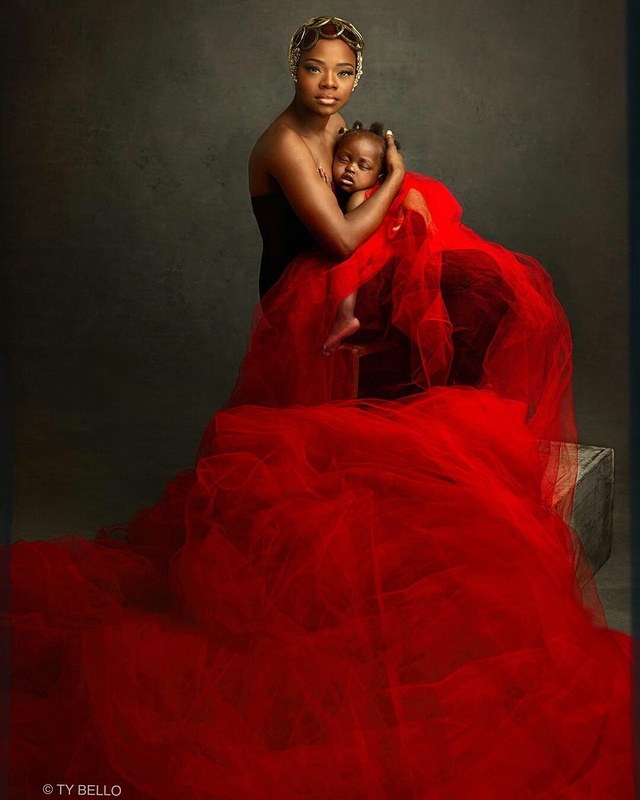 Olajumoke’s pulsating story of dropping out of school so her younger siblings could continue their education, to hawking bread in Lagos in 2011, to starting her own hairdressing salon which later failed, to sleeping in the bakery in Lagos with her daughter and about 40 other women, to waking up at 5am everyday to pray. Flashing a warm grin as she exchanged pleasantries with guest after guest as they made their way into the modest hotel in Yaba, an ever bubbling suburb in the heart of Nigeria’s commercial powerhouse – Lagos – last Wednesday evening, her bright complexion and lanky frame still stood her out even from the slightly dark corner where she and her 16-month-old daughter, Precious, were seated. Donning a black tank top, a pair of fitted denim jeans on top of a black plimsoll sneaker to match, you would be forgiven if you thought her smashing looks that evening was always the norm. But shockingly, it has not always been this good for 27-year-old Jumoke Orisaguna. About one week earlier, she was hawking freshly-baked bread across the streets of Sabo, Yaba and environs in almost tattered dresses and worn-out slippers. Every day since she made the long journey from her native Ire, an agrarian community in Osun State, to Lagos with her little daughter in January 2016 in search of a new life, she had worked at least nine hours a day, many times under the ferocious and scotching afternoon sun that sweeps across the city, to earn a decent living. The second child in a family of four children born to a poor farmer and a mother who sold vegetables to provide extra income barely enough to sustain the home, Jumoke knew the meaning of hardship even as a little girl. The loss of her elder brother, the first child of the family, meant that she had to provide direction for her three remaining siblings and also play a significant role in helping to bring food to the table. While many her age savoured the experiences of early puberty, Jumoke, by virtue of her humble background, had to grow up fast – and into an adult, too. For her, there was almost no childhood. “While the other girls would run around to play in the stream and engage in all sorts of games, I was either selling vegetables for my mother or helping my father on his farm because it was from these two areas that our daily bread came,” the young mother of two recalls with nostalgia during a rare encounter with our correspondent earlier in the week. “The opportunity for running around like the other girls wasn’t just there,” she added. With two wives and four children to feed, it became increasingly tough for the poor farmer to support the education of his children. As a result, Jumoke had to drop out of school after completing her primary education. Even though she knew if she must realise her childhood dream of becoming a renowned lawyer in the future she had to study further, the love for her younger siblings meant she had to sign up to a hairdressing training for them to also have a chance of becoming something big through education. “I had to choose between me continuing my education and my other siblings sitting back at home,” the 27-year-old revealed. “It was a huge sacrifice I had to make for them to also have a chance of becoming great in life through education. I always feel sad each time I see my childhood friends who are educated and have become successful professionals today. If I had someone to sponsor me, of course I wouldn’t have ended up as a hairdresser or even ever had to hawk bread. I still nurse the pains till this moment. “But instead of idling away at home or just selling vegetables for my mother and helping my father on his farm, I decided to learn hairdressing and make a meaning out of my life,” she said. And for the next three years, Jumoke horned her skills in one of the best hairdressing salons in the community, hoping to hit it big by the time she would become her own boss. By 2013 she had successfully completed the rigorous training and had rented and equipped a shop with the help of family members and the little amount she had managed to save during her first stint in Lagos hawking bread in 2011 for six months. But every hope of instant success soon fizzled into frustration and utmost disappointment. The reality on ground was a distant contrast to the result she had long envisaged. “Things became tougher after I opened the salon,” she cuts in. “You know since Ire is a town whose economic activities largely depend on the presence of the students of the Federal Polytechnic in the community, sales get very bad when they are not on campus. Luckily for the young woman, that decision has today turned out to be the wisest step she ever took. On the evening of February 2 while hawking her bread as usual, she crashed into something big – something that would change her life forever and write her name in gold. Celebrity photographer – TY Bello – was conducting a street shoot for Nigerian-born British singer, Tinie Tempah, on one of the streets dotting Yaba that evening when suddenly, from nowhere, Jumoke, with the heavy ‘baggage’ on her head, harmlessly sauntered into the scene. For her, it was another evening to service her many clients in the area especially at a nearby mechanic workshop where a handful of customers were already waiting for her. Have you seen the new Nigeria national team kit? Photos: Manchester City fans mock Manchester United with banner flown over Etihad stadium.